At Anglo French Removals, we offer a range of services to help make your move to France as effortless as possible. Along with part removals, vehicle transport and secure storage, we can also pack your items for you professionally if you wish. We offer a full packing service or a fragile pack; if we pack your fragile items for you, your items will be covered by our insurance policy. With over 30 years' experience of moving people to and from France, we understand all of the potential pitfalls and know how to avoid them. Our packing crews are fully trained in overseas packing (export packing) and have vast knowledge of packing all kinds of items, from antiques and pianos to fragile items like vases, paintings and other artwork. For the packing service for part or full removals to France, our team of highly trained and experienced professionals will pack your items for you, saving you the time and effort of packing them yourself. Plus, you can rest assured that your possessions are fully insured while being packed by our team of removals experts. Our mission has always been to make your move as easy as possible, and with our packing service it's no different. We'll categorise each item and afford it the care and attention it needs to ensure it's protected during the journey. For example, if you are getting antique furniture delivered to France, we understand it needs that extra protection for the duration of the journey. In addition, all of your possessions will be recorded using our computerised inventory system to ensure everything gets to where it needs to go. If you have paintings, pictures or particularly fragile items that need to be transported to France, you may want to use our fragile packing service. With this service, we use specialist materials to safeguard your items during the journey. For example, while bubble wrap will protect vase and other glass items, paintings often require special timber cases in order to protect them during transit. 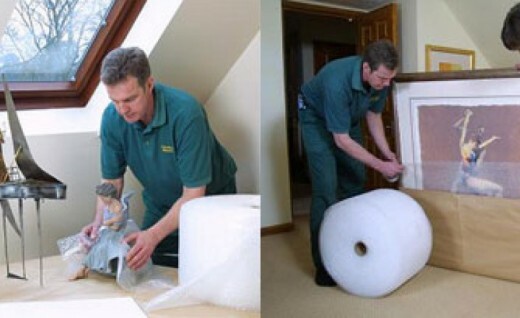 Plus, if we pack your fragile items for you they are fully covered by our insurance policy. If you're on a tight budget and/or would rather pack your items yourself, we can save you the trouble of sourcing adequate packing materials by supplying them ourselves. We offer a wide range of quality packing materials for various purposes, such as large boxes, bubble wrap, hanging garment boxes, tape and tissue paper. We'll even offer you advice on how best to pack your items to minimise the risk of damage. If you do decide to pack your belongings yourself, it's important that you complete all packing before our removal team arrives. So if you are moving to France from the UK or you're coming back the other way and you don't want the hassle of packing everything up yourself, the Anglo French packing team are here to help! Give us a call today on 01622 296237 to book your removal date or discuss your requirements with members of our helpful and friendly team.